Tyne Metropolitan College first team came away from Middlesbrough with a 1-1 draw but feel like two points were dropped after squandering several chances. In mild conditions, TyneMet played some of their best football to date in a half they dominated but missed chances spiked their performance. Joe Walton hit a post on 20 minutes after being played in by Regan Paterson. Then Walton was the provider, splitting the defence to find Jack Cooper, but the English schools’ trialist was denied by the keeper. The resultant corner should have brought a goal but Reece Harrison’s effort was cleared off the line and then Paterson hit the post in a scramble. On 32 minutes Middlesbrough struck a sucker punch when a long ball was not dealt with and the chasing Jack Hogg pulled back the striker and conceded a penalty, which was converted. At half-time there was definite feeling of injustice from TyneMet at being behind after dominating. An injury early in the second half forced Ciaran Fleming off and he was replaced by Alex Yarrow, and he was immediately in the action causing problems down the right. The game was more open and chances were at both ends as TyneMet chased the game. Cooper went close with two free kicks before the equaliser arrived on 65 minutes when a crowded defence could not stop a superb chipped pass by Harrison to Yarrow who beat the offside trap to finish well at the near post. TyneMet continued to hunt a winner but nearly got caught twice themselves with two counter attacks from the home side. However, two glorious chances to win the game were wasted by TyneMet. The first on 85 minutes when Cooper was through on goal but a heavy touch gave the keeper a chance to get his hand on the ball and divert the danger. 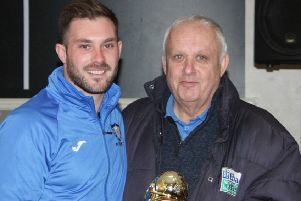 The second came with 20 seconds left on the clock when James Proctor played in fellow substitute Scott Woodhouse, who side-stepped the last defender and then wrong-footed the keeper only to roll the ball inches wide of the post.